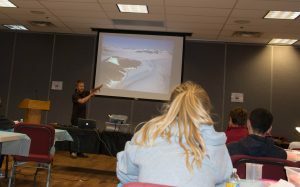 Our speaker, Dr. Jeremy Fyke, began by identifying the two largest ice sheets on the planet—Greenland and Antarctica. These ice sheets are massive, and dwarf the relative size of many countries. Greenland’s ice sheet is about 2 miles deep, while Antarctica is about 3 miles deep. If both were to melt, the world ocean level would rise by almost 200 meters. The majority of the world’s population is distributed near coastlines—especially very low elevation coastlines. This means that a significant portion of the world’s population would be greatly impacted by climate change. Ice sheets offer a great many possible study areas. For example, at the very lowest points in the Antarctic and Arctic ice sheets tens of thousand year old ice exists. This ice can be drilled out in ice cores over many years, and these ice cores are a record of atmospheric conditions at the time they were formed from compacted fallen snow. Since each ice sheet is continually being created by new snowfall, any new rocks would be buried below the surface. So any rocks found at the surface almost certainly are from meteorites. This method is used quite extensively as a way to efficiently gather meteorites for study. Study of climate change, ice sheets, and glaciers are an intersection of any scientific disciplines including physics, chemistry, oceanography, computer science, and environmental science. From super computer simulations to field work on ice sheets, many different skills are required to study these incredible formations. 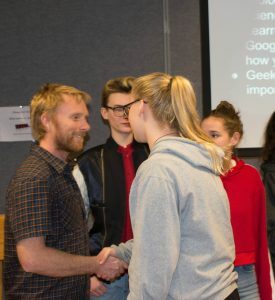 At the start of the café the students were divided in 6 table groups, and each group was given instructions and materials to set up an experiment simulating sea ice that would run the remaining length of the café. The setup involved two small bins filled with equal levels of water, marked on the side of the bins by tape. In one of the bins there was a brick upon which each group placed a piece of red colored ice. The teens had ice cubes, that were semi submerged, representing icebergs. The teens also got a glacier, which was a big chunk of ice on land. 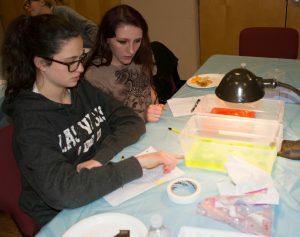 A light was used to represent the sun, and when the presentation was done, the teens could see how much the water rose. The true glaciers are Greenland and Antarctica, and they are melting because there are not enough storms to make the glaciers grow, so as soon as the temperature rises the glaciers melt. The coolest thing about the cafe was seeing the glaciers break, and how one of the big shifts in the glacier was as big as Manhattan. While frightening, it was still impressive to watch.